Gain valuable insight into any business. 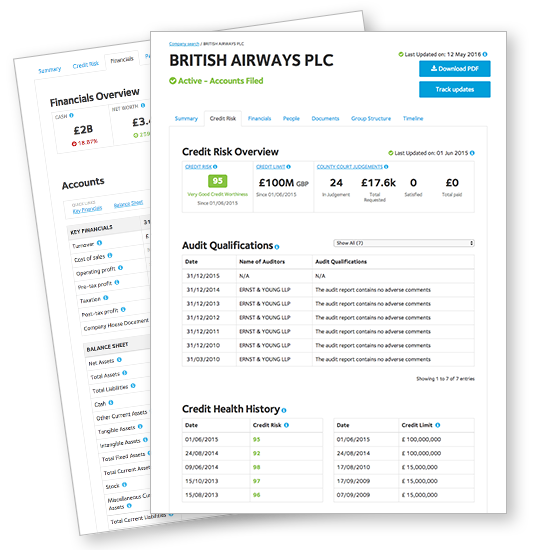 Instantly run company credit checks, view full company reports, annual accounts, CCJ history and much more for £4.99. 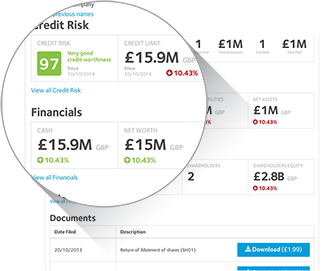 Instantly view a company's credit risk rating, financial accounts, CCJ history and more, for £4.99. Avoid risky business decisions. All reports show a credit score and suggest a credit limit. Access up to 5 years of accounts and financial details including turnover, profit and loss, balance sheets and capital reserves. Check for CCJs (or Scottish Decrees) as well as other legal notices, mortgages or charges. A low cost, no-commitment option; a one-off UK company report you can access anytime. Credit check as many UK companies as you like for less than £1 a day, also includes 240 company documents. Search for a UK company and receive email notifications when there are any changes to the company's report, such as the credit risk rating, if a CCJ is registered, when new accounts are filed, amendments to officer details and more. About to place a large order? Before spending a large amount of money on a product or service, you need to know whether the supplier you’re buying from can deliver. Conducting company searches or free director searches can reveal invaluable information about a business you are about to deal with, including the company credit rating, outstanding CCJs and 5 years of detailed financial accounts. Viewing these indicates the likelihood that the business will be able to repay their liabilities to you. Or maybe you’re about to accept a large order? Similarly, if you make a product or provide a service, and a company wants you to provide them with credit rather than payment upfront - a report on your credits, accounts and directors can give you some idea if the business will be able to pay you for what you’ll be providing. Before your business enters into a relationship with another company, utilise the information that a company credit and director check can provide you with and ascertain how wise it would be to associate yourself with that company. These are just a few of the scenarios where performing searches on businesses of interest could help you. These services, such as director reports, free update alerts and company documents (you can download copies of documents such as confirmation statements and company accounts) should become a key part of your arsenal when deciding who you do and don’t work with. Credit check companies today and find out who you’re really doing business with.